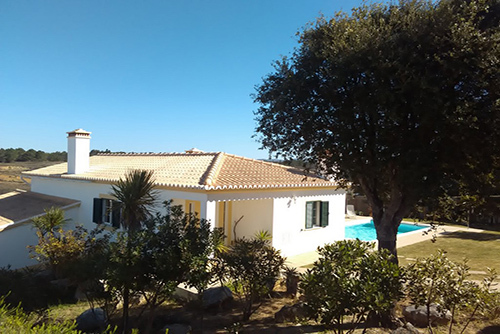 Casa Nikki is a cosy holiday home with private pool, well situated and nice views. Casa Nikki is a cosy holiday villa with a private garden and pool with a great view to the valley. The house is situated in the urbanisation Vale da Telha (Aljezur) near to the beach and is equiped for 6 people. The beaches are on 4km distance, where you have great conditions to surf. In the neighbourhood is a daily opened grocery with fresh bread. The historic town of Aljezur (7km) has a range of shops, restaurants, banks, a post office, mini-supermarkets and museums. Around the house you have plenty of private space and a swimmingpool. Provided are outdoor table, chairs and sunloungers. Near to the entrance of the house, you can enjoy your meals after grill on the barbecue.